Manufacturer, Supplier and Exporter of all kind of Neutral Brass Bar Link, Neutral Links, Brass Neutral Links, Neutral Bars, Terminal Blocks, Terminal Bars, Earthing Block, Earthing Bars, Brass Electrical Neutral Links can be developed and supplied exactly as per customer specifications. Manufactured keeping in mind the highest levels of quality, we are availing to the customers a standard range of these Brass Neutral Links. The offered range has been processed out of the best grade brass that had been purchased by our procuring agents from the most reliable sources present in the market. Available in neutral bars, the size can be pre-specified by the customers as per their needs. We offer to the customer this range of Brass Neutral Links that is availed to the customers in terminal blocks of up to 1 metre length. Our firm is also able to provide these in 4 way and 8 way links. We have stringently manufactured these links for all types of panel board, switch gears and electrical switch boards. We are one of the reputed names in the industry, which is engaged in manufacturing, supplying and exporting a comprehensive range of Copper Bus Bar Supports. These copper bus bar supports are manufactured by our engineers as per the industry laid standards & norms. 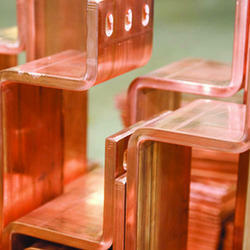 Further, these copper bus bar supports are widely demanded in the engineering, automotive and allied industries.